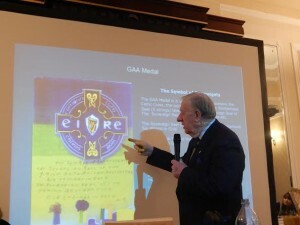 The President of the Irish Republican Brotherhood, William James McGuire would like to thank the Lord Mayor of Dublin, Críona Ní Daláigh and staff at the Mansion House and all who attended the Cabinet Room at noon for the 97th Annual Turning of the Sovereign Seal of Dáil éireann and Dáil éireann courts (4 courts) and to celebrate Ireland’s Independence Day since 21.1.1919. 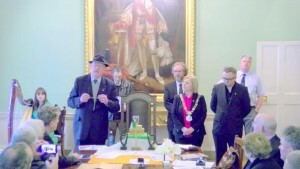 Among those in attendance were the Dublin City Manager, Chief City Archivist Mary Clarke and the Belfast City Mayor, Arder Carson. Críona Ní Dhaláigh read aloud the IRB’s 1916 proclamation. 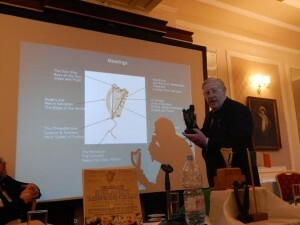 The event in the Mansion House was culminated by a presentation from the President of the IRB on the importance of the Turning of the Sovereign Seal Harp in claiming Ireland’s natural resources of oil, gas, minerals, water and fishing rights which belong to the Sovereign People of Ireland as proclaimed, exactly and verbatim in accordance with the 1916 Proclamation. The day’s celebrations continued with a large gathering at the GPO for a reading of the proclamation beneath the pillars. 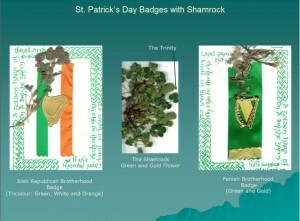 A walking tour proceeded towards Moore Street and O’Rahilly’s Parade where the 1916 I.R.B. Military Council made their last attempt to freedom in order to reach the tunnel at the Rotunda which led to IRB GHQ Vaughan’s Hotel, 29 Parnell Sq. The Sinn Fein 1916 Commemoration coordinator, Bartle D’Arcy, addressed the crowd at the Ambassador on their recent opening of the escape tunnels. A wreath laying ceremony followed at the Garden of Remembrance for all the Irish Volunteers who gave their lives for the cause of Irish freedom. The tour finished at the plaque on Vaughan’s Hotel, opposite the Garden of Remembrance, with a brief description on the significance of this Historic building, where Dáil éireann and the Dáil éireann courts were funded and founded by the I.R.B. A public event took place at Wynn’s Hotel on Abbey Street from 3- 6 o’clock with guest speakers and Harpist.The IRB wish to thank all who participated and attended the celebration of the 97th Anniversary of the Declaration of Ireland’s Independence.